A page of menu screens from Warner Home Video's forthcoming releases of The Beast Must Die and Blood of Fu Manchu discs is available here. I've also added screen grabs from the Warner Home Video and Anchor Bay UK versions of The Beast Must Die. Neither version is very impressive, but Warner's version has the edge for colour balance and detail. Back on Monday, with news, updates and new reviews! 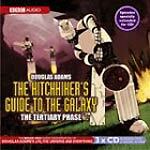 Amazon have reduced the price of the Hitch-Hiker's Guide To The Galaxy - The Tertiary Phase triple-CD set to a jaw-dropping £9.59 - click here to pre-order a copy! They've also got the Douglas Adams at the BBC set for the same price. The Tertiary Phase is released on October the 25th. Be aware that the BBC are planning to release a Dolby Digital 5.1 version of the series. If you're a fan of Smallville, the Warner Brothers series about Superman's teen years, you might like to peruse the Smallville - Season 1 Official Companion book review that I've written. You can find it here. I've added a new Reviews Index page today, to facilitate easy access to the film, book and audio book reviews. You can find the page here, or by clicking on the "Reviews Index" button near the top of the left-hand column. You can get to the DVD reviews that way, too (as well as via the "DVD" button). Tartan have announced the addition of four more Begman films to its catalogue. These are due on December the 6th. These are: Torment (Bergman's debut as screenwriter, 1944), Port of Call (1958), the 1954 comedy A Lesson In Love and controversial 1969 TV movie The Rite. Each film has been restored and re-mastered, and will be presented in their original aspect ratio. Other extras will include trailers and notes by Philip Strick. RRP is £19.99 each. Let's begin the week with another new review! Contributor Mike Hadfield has taken a look at Universal's Columbo - The Complete First Season DVD set, which was released recently. The six-disc set features two pilot movies, and the first seven movie-length episodes, from 1971. It's worth noting that, despite the series appearing on three different terrestrial channels recently, quite a few episodes of the long-running series haven't been transmitted for a very long time! Click on the sleeve image, right, or here to read it. There are three new competitions beginning today, offering you the chance to win Granada Ventures' new The Prisoner box set, the second season of Millennium, from Twentieth Century Fox Home Entertainment - out today! - and a copy of Eternal Sunshine of the Spotless Mind, and some sunny T-shirts, courtesy of Momentum and Focus Pictures! Click on the banners, above, or here for The Prisoner competition, here for the Millennium competition, or here for the Eternal Sunshine of the Spotless Mind competition! If you're in London this afternoon, you might want to attend Christopher Lee's signing at the Forbidden Planet Megastore (it's at 179 Shaftesbury Avenue, if you've not been in the last year or so). 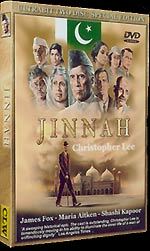 Mr Lee will (only) be signing copies of the two-disc Jinnah DVD (which Lee regards as the best and most important film he's appeared in), and The Dark Secret CD (of which I know nothing, sorry!) The signing takes place between 5 and 6pm. You can contact Forbidden Planet for more details (on 0207420 3666), or order signed copies from their mail order department (on 0207 7803 1900). There's no update from Ceri this week. For the latest bargains visit The High Street section of Roobarb's DVD Forum.